The IPCC recently launched the Working Group II Fifth Assessment Report on Climate Change: Impacts, Adaptation and Vulnerability in Yokohama, Japan. The report considers the vulnerability and exposure of natural and human systems, observed impacts and the future risks of climate change. Importantly, it also draws attention the solution space for societies, economies, and ecosystems around the world. The report concludes that we are already seeing the impacts from climate change on agriculture, on human health, on terrestrial and marine ecosystems, on water supplies, and on people´s livelihoods. These impacts are occurring all over the globe, from north to south, in the poorest and the wealthiest countries. The world is currently on a trajectory that holds much higher risks, but the report makes it clear that many of these risks depend on human responses to climate change. Increased warming will result in increased likelihood of severe and pervasive impacts that potentially can be irreversible, with the risk reaching points whereit is not longer possible to adapt without facing intolerable losses. 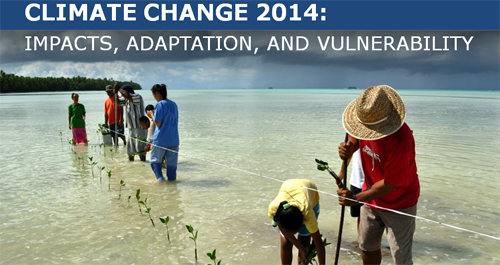 The report assesses the potential for adaptation, especially for managing the impacts already experienced and and those expected to occur over the next decades. It recognizes that the prospects for climate-resilient pathways for sustainable development are related funamentally to what the world accomplishes with mitigation. Transformation in economic, social, technological and political decisions and actions are considered critical to generating sustainability. Visit the Intergovernmental Panel on Climate Change Working Group II website and download the Summary for Policymakers and the individual chapters.